I thought I'd seen it all when I read on Vera's blog about a funeral company offering their service as the perfect Valentine gift. It is so morbid, but in some ways can be seen as romantic - you guys will be together till death and not even that will separate you - and funtional. 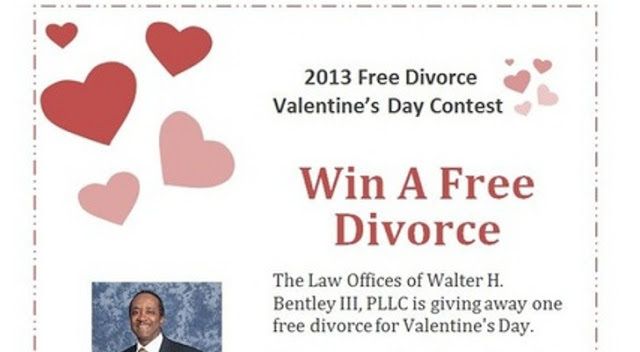 Now some lawyers are taking it a step further, offering a valentine contest with the prize being a free divorce. Again, this gift is not for me. In fact I reject am though the lawyer offering up believes he's being nice in doing it. He got the idea, he tells ABC News, when one of his students in a night school class he teaches invited him to a party. "She'd just had her divorce finalized," says Bentley, "and she was celebrating. I'd never thought about that before—celebrating divorce. So, I thought, why not do something special for Valentine's Day? 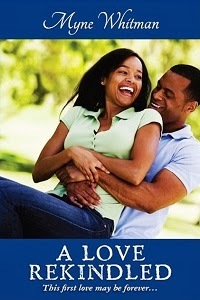 You can't find a new love before you close the chapter on the old." Bentley's website gives contest rules: "The winner will be chosen based on the most compelling and convincing story as to why they should be the winner. The divorce is limited to an uncontested divorce with no or minimum child custody issues." It's limited to Michigan residents. The deadline for applying is 11:59 p.m. EST on February 12. Nearly 500 people have applied so far, says Bentley. As decision hour nears, he his colleagues, he says, will narrow down the list, picking the stories they feel are most affecting. Then, after the contest closes, they will make their decision. "We're looking for someone truly struggling to move forward," he says, "maybe someone who's overcome some obstacle —a foreclosure, say. Maybe they're struggling to make ends meet, and they don't have enough money for a divorce." An illness also could give them a leg up. "Somebody diagnosed with cancer. Maybe that's one reason their spouse no longer wants to be with them," he speculates. A quick look around the U.S. by ABC News found some other attorneys offering divorce specials for Valentine's Day, but in them the winner is expected to pay court costs and filing fees. Bentley's appears to be the only completely free ticket to splitsville. "They won't have to take out their wallet for anything," he says. "All the hearings, all the paperwork. I will pay all the fees and expenses, to the end. What they're getting would ordinarily cost them $1,500 to $3,000." What kind of feedback has he gotten from clients or fellow attorneys? "90 percent positive. They all know I've got a big heart." Nahhh... I don't think valentine and divorce should even be in the same sentence. If one is having problems in their marriage, a better option, especially around the day of love, is to seek counseling and reconciliation.